Why Are Development Agencies Giving up on Development? You guys from the World Bank say you want to help the government of India with our development agenda but then all you want to talk about is poverty, poverty, poverty. Let me point out two things. First, India is a democracy and hence to be the government at all we have to have 51 percent of the votes and we don’t have that many poor voters. Second, once we are the government of India we are the government of all Indians, not just the poor ones, so our agenda has to reflect the aspirations of all Indians. So either you are really helping us with our development agenda or you are just pushing yours. The World Bank has decided to make this problem – the divergence of the organization’s rhetoric on “extreme poverty” and their clients’ desire for support in their national development agendas – even worse. They have announced that their goal is to “eradicate extreme poverty” (while only “monitoring” the income of the poorest 40 percent in each country—but with no goal). This new goal is meant to sound like a bold and ambitious target but is exactly the opposite. This is a dramatic retreat by the World Bank, a shift from an organization that supports national development agendas towards an organization that just promotes cost-effective charity work. This new focus is wildly at odds with what leaders of developing countries and their citizens want, care about, and want global support in accomplishing. This new goal is like a World Series champion team announcing their goal for the next seasion is not scoring runs or winning games but just bunting well. The problem is that the exceptionally penurious definition of “extreme” poverty concocted by international elites as a global target includes too few people to be the basis for a development agenda for most of the world. Table 1 shows the 20 most populous countries in the world (which includes all developing countries with more than 60 million people). This includes 4.9 billion of the world’s 7 billion people. If your agenda isn’t relevant in these places, it just isn’t really a global development agenda. Ask: “in how many of these places does ‘extreme poverty’ include the median voter?” More concretely, in how many of these places is the headcount poverty rate above 50 percent of the population? The answer is just two: the Democratic Republic of Congo (ex-Zaire) and Nigeria. As my friend in India points out, while India does well on measures of democracy, it has only 6 percent of the output per person of the world’s highest, and faces significant challenges with governance. Yet the headcount poverty is less than a third of the population. Is the median voter in India really so well off that helping them improve their lives and livelihoods cannot be included in the World Bank’s goal? China’s economic performance has been staggering over the last few decades so its “extreme poverty” rate is only 11.8 percent. That certainly means China needs no financial support from development agencies but is China—with only 16 percent of the per capita income of the world’s highest and substantial challenges in governance – now completely off the development agenda except for its bottom-most 11 percent? In some countries at the top of the world’s priorities there are severe development issues and yet almost no extreme poverty. Certainly Egypt has massive challenges in development—yet its “extreme poverty” head count is only 1.7 percent. Despite Iran’s high income from oil, its development index score is only on a par with Indonesia and India—but extreme poverty cannot anchor a development agenda there as only 1.5 percent are in extreme poverty. 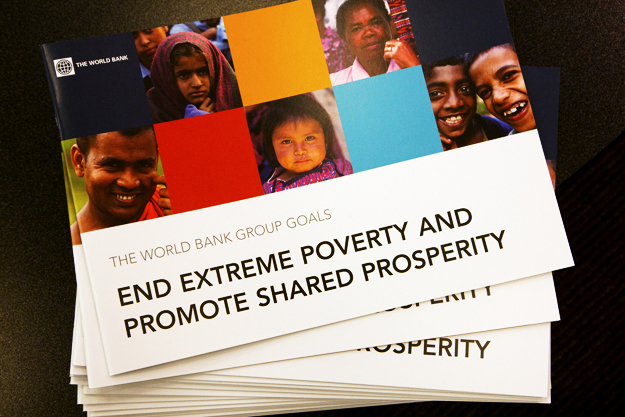 Eradicating extreme poverty has to be just one among many development goals. It cannot be the sole or primary goal of a development organization that wishes to remain engaged productively with national governments. You cannot set organizational goals that ignore the more than half the population of of all but two of the world’s 20 most populated countries and still remain a global force for progress in development.